Thousands of demonstrators marched in Hong Kong on Tuesday to demand full democracy, fundamental rights, and even independence from China in the face of what many see as a marked clampdown by the Communist Party on local freedoms. Over the past year, countries such as the United States and Britain have expressed concerns about a number of incidents they say have undermined confidence in Hong Kong's freedoms and autonomy under Chinese rule. These include the jailing of activists, a ban on a pro-independence political party, the de facto expulsion of a Western journalist and barring democracy activists from contesting local elections. The New Year's day march included calls to restart stalled democratic reforms and to fight "political repression" from Beijing. "Looking back at the year that passed, it was a very bad year ... The rule of law in Hong Kong is falling backwards," said Jimmy Sham, one of the organisers. Organisers said the march drew 5,500 people, revised down from an earlier estimate of 5,800, while police said 3,200 people were on the streets at the march's peak. The former British colony returned to Chinese rule in 1997 under a "one country, two systems" formula, with the promise of a high degree of autonomy and universal suffrage as an "ultimate aim". 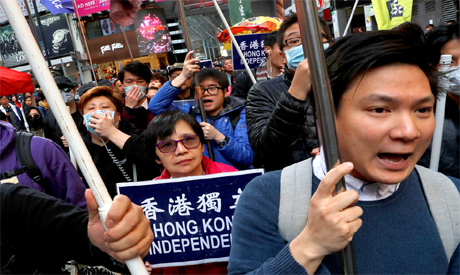 While authorities have clamped down hard on the city's fringe, pro-independence movement, that didn't deter around 100 independence activists from joining the march, holding up banners and chanting for the city to split from China. China considers Hong Kong to be an inalienable part of its territory, and denounces "separatists" as a threat to national sovereignty, even though the movement has not garnered much popular backing in the city. "There will be continuous suppression on the Hong Kong independence movement, but the movement will grow stronger and stronger," said Baggio Leung, an independence leader who said several of his members had been harassed by purported "triads" or gangsters, before the march. Last year, in an unprecedented move, Hong Kong authorities banned a political group, the Hong Kong National Party, for its pro-independence stance on national security grounds. A western journalist, Victor Mallet, was also effectively expelled from Hong Kong, soon after he hosted a talk at a press club by the head of the National Party. Mallet's visa denial, which the government has so far refused to explain, was criticised by some foreign governments and the American Chamber of Commerce. Some protesters carried "wanted" posters of Hong Kong's top legal official, Theresa Cheng, criticising a decision to drop a corruption investigation into Hong Kong's former pro-Beijing leader Leung Chun-ying, without a satisfactory explanation. "I'm afraid the pressure will continue," said Joseph Cheng, a veteran rights campaigner and retired professor who was raising money for a "justice" fund for activists facing hefty legal fees for several trials. "We're going to face a few difficult years, but we must stand firm ... Unlike in mainland China, at least we can still protest."